Children love snacking. Having one of the best snack containers for toddlers reviewed in this article makes it easy for mothers to pack a healthy snack for the kids both indoor and when they’re away from home. In the past, it used to be a plastic bag, now a more eco-friendly solution is the washable snack containers, they’re not only reusable, they’re equally pocket-friendly. Having a snack container solves two main problems simultaneously; dealing with the children’s constant desire to eat something, as well as easing the cleanup process for mothers. Some of the factors that have been considered in coming up with this list are; BPA free plastic, spill prevention, compatibility with cup holder in major cars and strollers, as well as being dishwasher safe. This product comes in four different color variations. A pair comes in two different colors. One of the major benefits of using a snack container is to prevent crumbs of snack from falling over the floor. The Munchkin snack catcher does this considerably well, by allowing easy access to the snack through a soft flap opening or slit, which also prevents the spillage of snacks all over the floor. The base of the snack container has a no-slip rubber that prevents the container from falling over when placed on the floor. The two handle on both sides of the container allows easy handling for the toddler. It comes in two major pieces which makes it very easy to clean after use. The container is made of BPA free plastic. They hold on well to cereals, Cheerios, animal crackers and other large snacks. 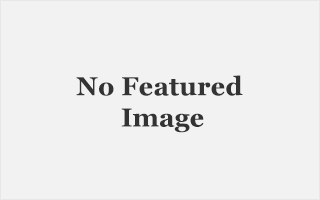 On the negative end, however, older kids tend to know their way around opening the cover, thus defeating the anti-spill purpose of the container. If your child is well below the age of three(3), it’s the best snack container to get for them. This snack container is more suitable for older kids; a year and above. The flip top feature of the container makes it easy for the toddler to access the snacks, and also easily close the lid when they’re done. It comes in three different colors. 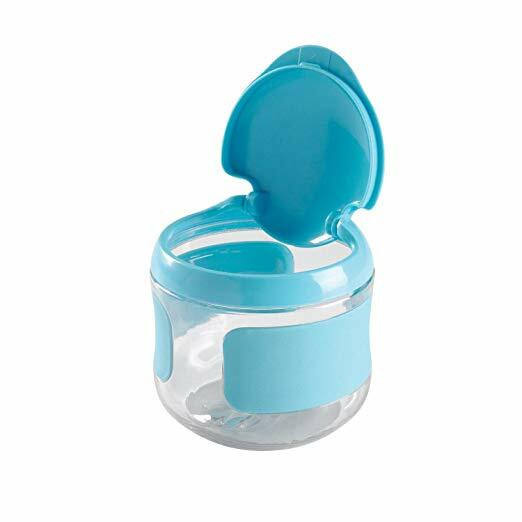 As compared to the Munchkin snack catcher, this container does not have a handle, but the sides are designed for easy grip. Completely free of BPA and PVC, making it a healthy container choice for your child. The lid flips open to allow access to the snacks inside the container, but not completely detached from the container itself. This is a good design, as it prevents the loss of the lid. It also fits perfectly in car cup holder and strollers, making it easy to move around when stepping out of the house. The container comes in 5 Ounces, which is small enough to sit comfortably in the diaper bag without taking up much space, yet adequately big enough to contain the snacks. Although it comes in two major pieces and dishwasher safe, removing the head from the main container is a bit of a struggle, and can easily get broken if not handled with care. #3. 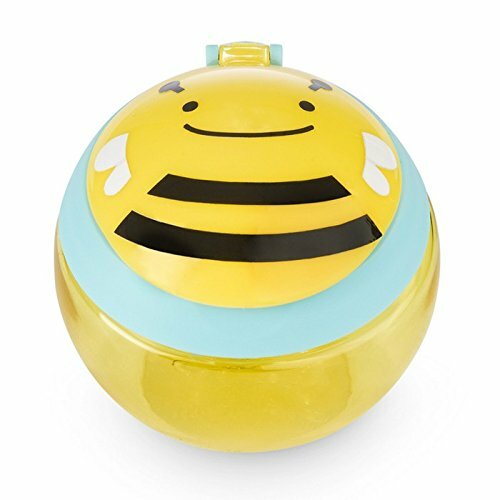 Boon Snack Ball Snack Container. The idea behind this product is brilliant. 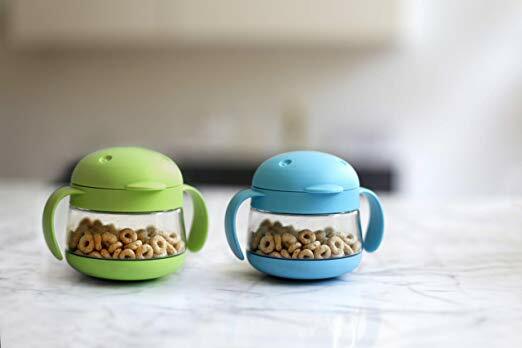 The snack container is designed in such a way that, when the lid is closed, your child can roll the ball as a toy. Serving two purposes at the same time; being a snack container as well as a play toy. Obviously, it will the toddler’s preferred choice of snack container. While the shape is interesting, what is more, interesting about the product is the size. It’s designed to be the perfect choice for travel, as it is about 6oz in size. Fit’s nicely into cup holders, and it does not take up space in bags. 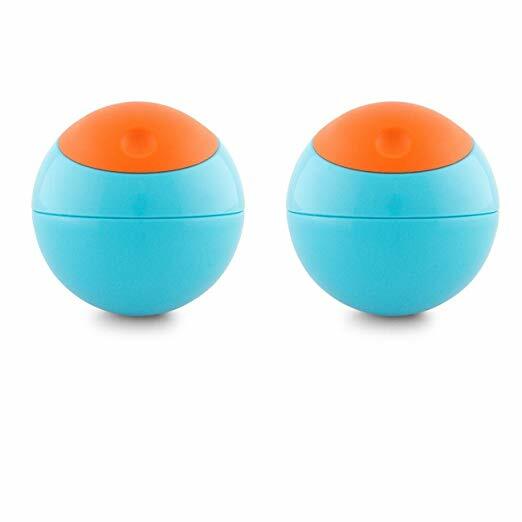 Boon Snack Ball snack container can be easily separated into two pieces, making it easy to clean, as they’re dishwasher safe. It’s also made of BPA and PVC free materials. Although a bit smaller than it appears in the picture, it’s still one of the best snack containers for toddlers as it is able to withstand throwing and accidental drops without breaking. The lid slides to a side to open, so snacks do not escape from the container, accidentally. This product is might be a bit small for bigger kids, as they would find it difficult to dip their hands into the container, and might end up pouring out the content, thus defeating the purpose of the snack container. Aside from that, it’s the perfect choice for smaller kids. It’s equally available on Amazon. The product comes in three different zoo designs that your child would love. The shape is a bit similar to that of the Boon Snack container, but in contrast, it has a flat bottom, as well as a handle for gripping. The top lid snaps to open, thus making it easy for kids to access the snacks. 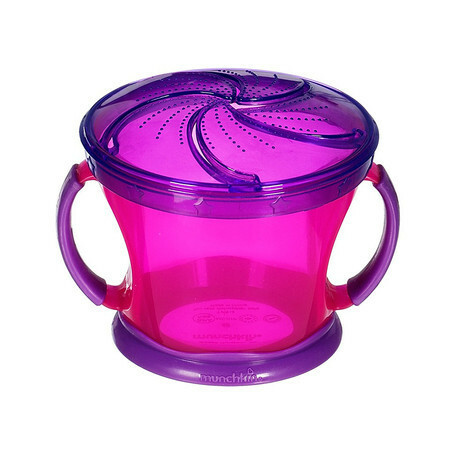 After opening the top lid, the flexible inside opening allows the kid to reach into the container while preventing a spill, even when the container is turned upside down. Made of BPA and PVC free material, making it safe for children to use without the fear of health hazard. The handle is designed to fit into a stroller or diaper bag, for ease carriage on the go. In size, it can hold up to 7oz. 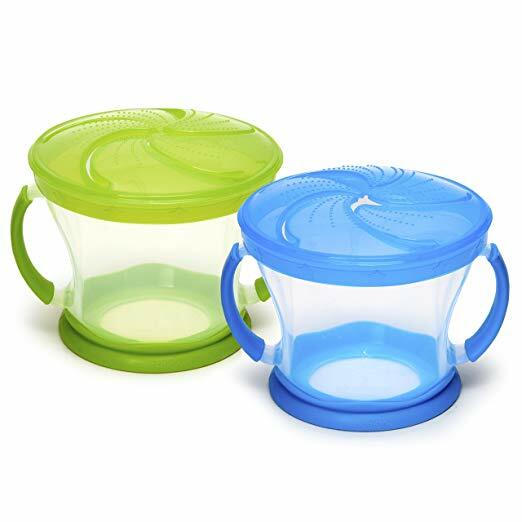 The container is made of transparent plastic, making it easy for the parent to know when there is a need for refill rather than opening the container every now and then. On the negative end, the design on the container tends to fade off over time, but yet it still makes a great snack container for kids. This is the biggest contain on the list, with a 9oz capacity. Aside from the top lid that can easily be opened with a little push for access into the container. It has a soft spill guard that is equally removal. Often as the kid grows, the need for the spill guard isn’t apparent, but most soft spill guards are not removable, but the ones on Ubbi Snack container is easily removable, granting maximum access for older kids. The snack container is made of BPA and PVC free plastic. The handle also makes it easy for kids to carry around. It fits nicely into backpacks. Although not compatible with cup holders, it makes a great snack container for kids that are well above 12months. There you have it; a detailed review of the best snack containers for toddlers in 2018. Cheers to healthy snacking with no stress. Next ArticleBest Diaper Bags Backpack (Small, Large & Convertible) 2018.